When it comes to trading, one of the very first things I started trying to teach myself was a very simple concept: Buy Weakness, Sell Strength. 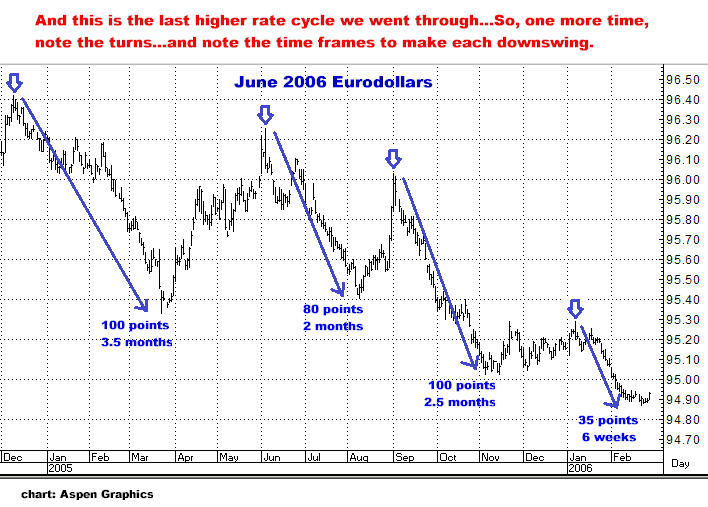 I am 150% convinced that rates are going up, and that Eurodollars are in the earliest stages of a lengthy downtrend, and therefore see their recent 2 month long, 30 point rally, as nothing more than that, JUST a rally in a bear market…And getting down to specifics, I think yesterday’s very emotional action (with the Dow down 370 points), which produced a semi-big 6.5 point higher close in December Eurodollars…taking them into new 5 month highs…but then reversed today, WAS the end of this quite normal (in retrospect) two month rally…AND THAT WHAT YOU ARE SUPPOSED TO BE DOING NOW IS BUYING MORE PUTS. YOU SELL THIS RECENT STRENGTH. 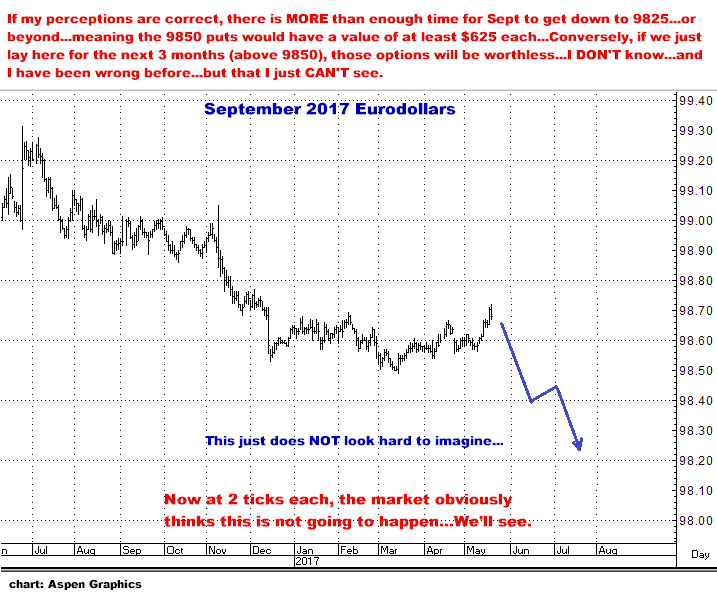 Two month ago, Eurodollars were making new lows and I was quite certain they were beginning a new leg down…and I consequently did nothing to take some of our profits off the table as I thought “the real move” was right in front of us. In retrospect, I was obviously wrong, and consequently watched a LOT of money disappear as the market then spent all of the time since then drifting sideways to painfully higher. But…This is not a perfect science. I make mistakes…plenty of them…but I also DO get it right sometimes… and having done this for a long time (too long), one thing I know about this business is you CANNOT let being wrong…or having recently made the wrong decision…affect your decision making about what to do NEXT. Predicting and trading the markets can definitely be a tremendously emotional experience (highs and lows), but AS A TRADER, YOUR OBJECTIVE SHOULD ALWAYS BE TO DO WHAT YOU ARE SUPPOSED TO DO…WHEN IT IS TIME TO DO IT…AND RIGHT NOW, WHAT I KNOW DOWN TO MY TOES IS…HERE, RIGHT NOW (AND NOT A WEEK FROM NOW), AFTER THIS 30 POINT RALLY, AND WITH ALL OF THE VERY OBVIOUS FEAR IN THE MARKETS YESTERDAY, AND THEN A SOLID REVERSAL DOWN IN EURODOLLARS TODAY, IS WHERE YOU ARE SUPPOSED TO BE BUYING PUTS. 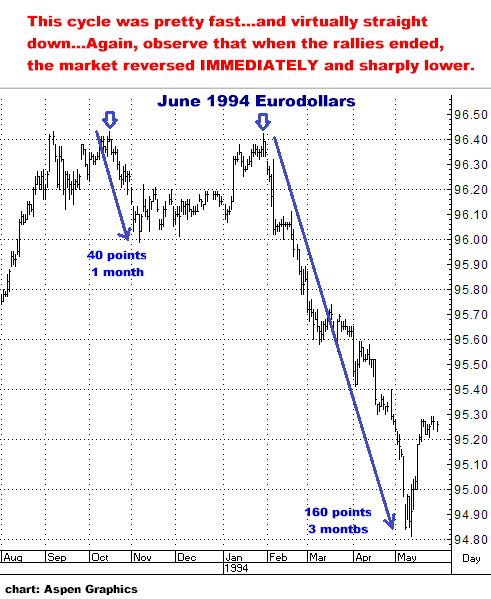 And per the research that follows here, I think it is very safe to conclude that the next thing we are minimally going to see is 50 or 60 points on the downside…And if so, that IS where we will be taking some money off the table. 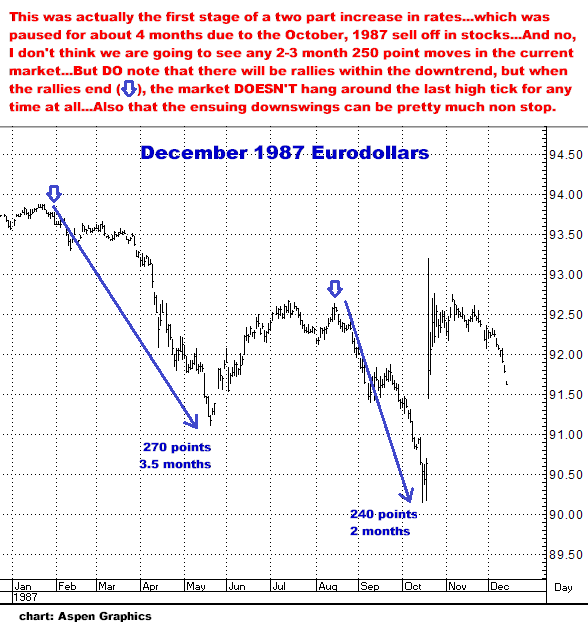 How big the downswings were. How long they took to develop. 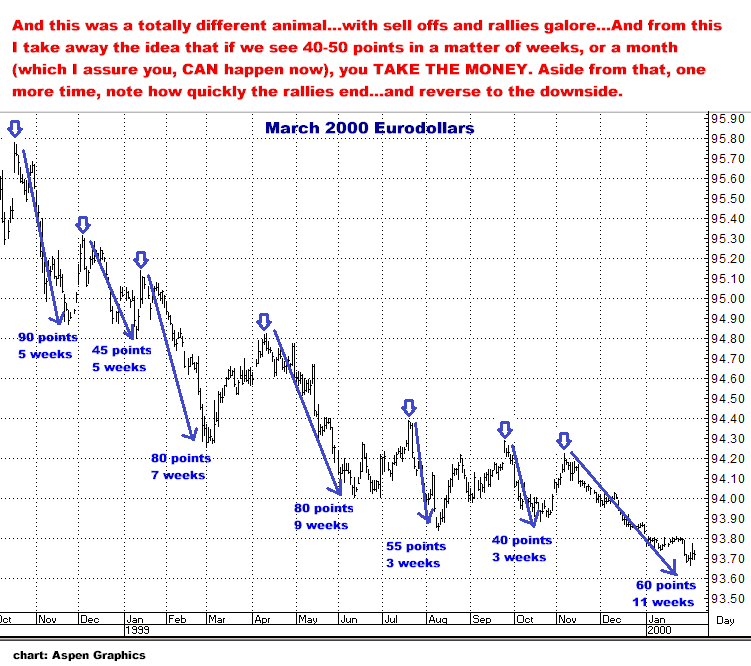 How quickly rallies within those bear markets reversed (and why you need to act just as quickly when they do reverse, as I believe is exactly what we have had today). I’m not perfect. 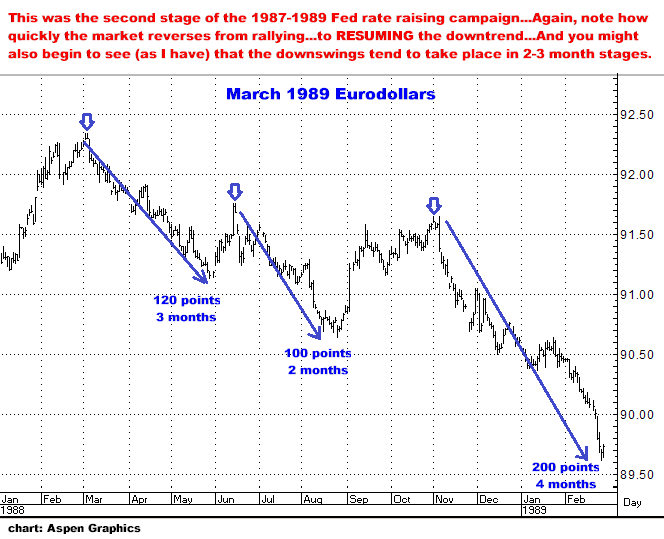 But I do my homework…And what you do have here is every example of how rates have gone up for the past 30 years…And every time it was different.. but as I said, there ARE similarities to be heeded. I THINK THE ODDS ARE EXTREMELY HIGH THAT THE CURRENT RALLY HAS ENDED. I THINK IT IS REASONABLE TO ASSUME WE ARE ABOUT TO SEE AT LEAST A 50-60 POINT SWING ON THE DOWNSIDE FROM HERE…WITH THE MOVE TAKING NO LONGER THAN 2- 3 MONTHS. THE SEPTEMBER OPTIONS STILL HAVE OVER 4 MONTHS UNTIL EXPIRATION, WHICH I BELIEVE MEANS THERE IS MORE THAN ENOUGH TIME TO SEE THE SEPTEMBER CONTRACT GET DOWN TO THE 9820 AREA…THUS MEANING THE SEPT 9850 PUTS WOULD BE 30 POINTS IN-THE-MONEY, GIVING THEM A VALUE OF $750…WHICH I KNOW SOUNDS CRAZY WITH THEM CURRENTLY TRADING AT 2 TICKS, OR $50…BUT…THAT IS THE WAY THE NUMBERS WORK IF THE DOWNTREND DOES RESUME…AS I THINK IT WILL NOW BE DOING. 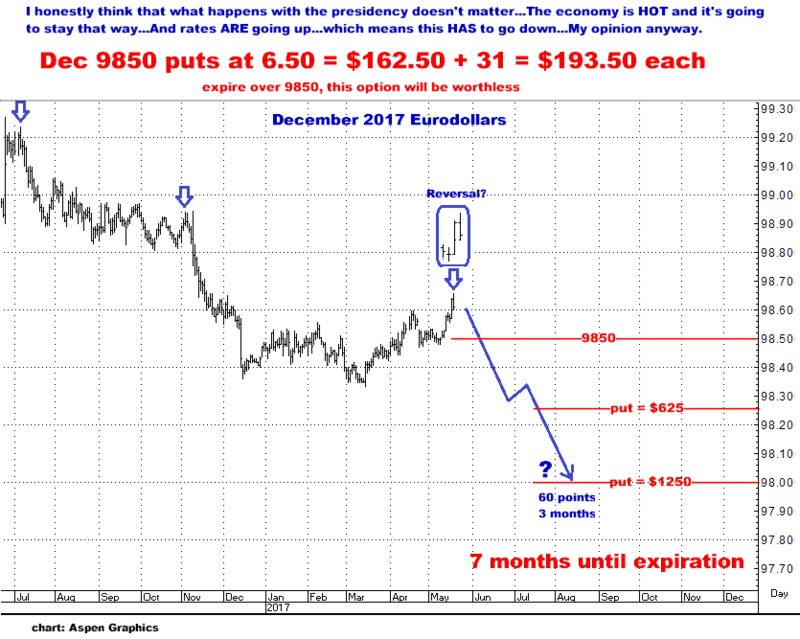 AND FINALLY, WITH THE DECEMBER 9850 PUTS BEING JUST 11 POINTS OUT-OF-THE-MONEY, AND CURRENTLY COSTING $192.50 EACH…AND HAVING AN INCREDIBLY LONG 7 MONTHS OF TIME…I THEN ESPECIALLY BELIEVE THERE IS A MOUNTAIN OF MONEY TO BE MADE (OR YES, LOST) IN THEM…AND THEREFORE STRONGLY RECOMMEND PICKING UP AT LEAST UP SOME OF THEM HERE…IT DOESN’T MATTER HOW MANY…BUT I SAY YOU ABSOLUTELY MAKE THE MOVE HERE…INTO WHAT I PERCEIVE AS BEING THE END OF A 30 POINT RALLY…HANG ON TO THE SEPTEMBERS…AND GET SOME DECEMBERS. AS A TRADER, IT IS WHAT YOU ARE SUPPOSED TO DO HERE…REGARDLESS OF WHAT “SHOULD” HAVE BEEN DONE BEFORE. Let’s GO! It’s game time…No tears...J…Give me a call…DO what we are supposed to do.